Why is it a Great Gift ? : Who does not love Chocolates? Truffles make perfect gifts for any occasion such as Birthdays, Valentine's, Raksha-bandhan and Diwali - they are a great modern day substitute for traditional Indian mithai. Send a box today and participate in the joyous occasion. 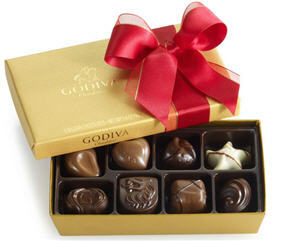 Enticing, sensual, and destined to be savored slowly, Godiva Signature Truffles are the chocolate lover's chocolate. An elegant gift, an unforgettable indulgence. Contains one of each: Milk Chocolate Truffle, Dark Chocolate Truffle, Hazelnut Praline Truffle and Double Chocolate Raspberry Truffle.